Andrei Salak, a researcher at CICECO and Department of Materials and Ceramics Engineering (DEMaC) of the University of Aveiro, was recently awarded with the Honorary Diploma of the National Academy of Sciences of Belarus (NASB) for a considerable contribution to the scientific and technological cooperation between Portugal and Belarus and coordination of efforts of the international group of researchers in the area of the contemporary Materials Science. Andrei Salak completed his PhD at the Institute of Solid State Physics and Semiconductors (ISSPS) of NASB in 1994 and joined CICECO-DEMaC in 2002. Along with his post-doctoral activity at CICECO in development of microwave dielectrics (2002-2008) and in the area of corrosion protection and surface engineering (since 2008), Andrei Salak continues his research in a field of ferroelectrics and multiferroics based on high-pressure-stabilized perovskite phases. Successful collaboration between CICECO-DEMaC and ISSPS in this field has resulted in more than 20 joint publications. Andrei Salak is the Principal Coordinator of the project 'Tuneable multiferroics based on oxygen octahedral structures' (TUMOCS, 2015-2018, http://tumocs.web.ua.pt) that receives funding from the European Union’s HORIZON 2020 programme MSCA-RISE. The project joints 7 academic organisations and 1 SME from 6 countries. 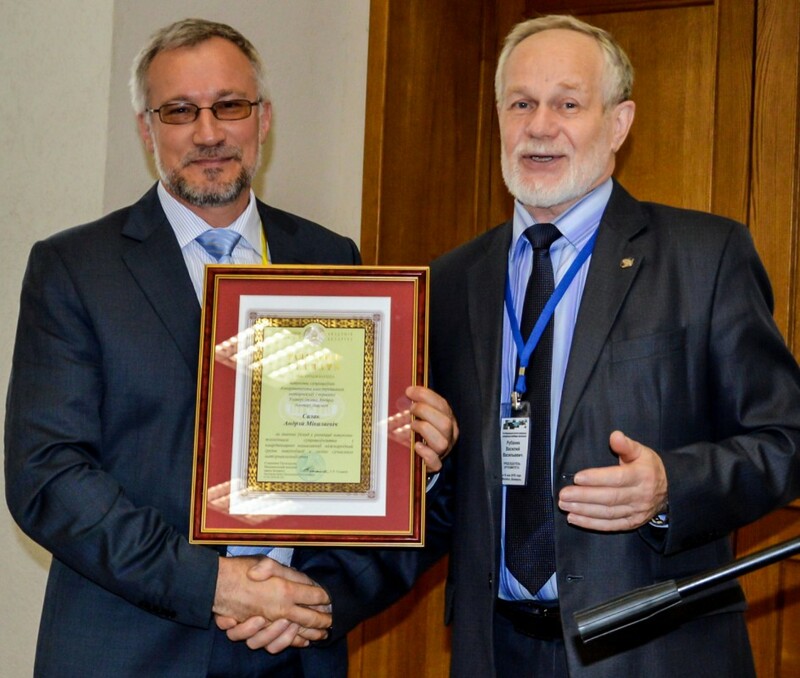 Two research organisations of NASB, namely the Scientific-Practical Materials Research Centre in Minsk and the Institute of Technical Acoustics in Vitebsk, are members of the TUMOCS Consortium.